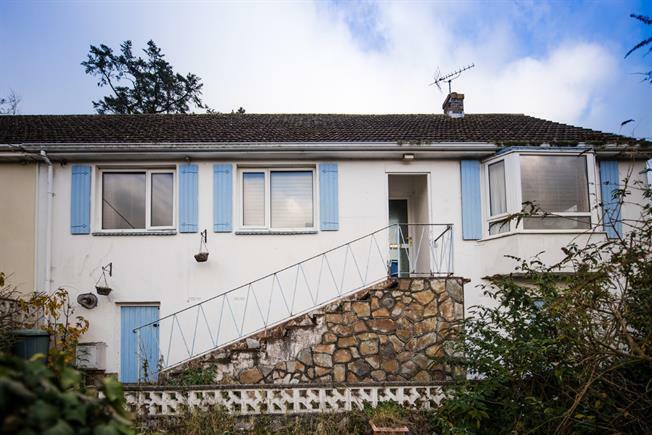 3 Bedroom Semi Detached Bungalow For Sale in Teignmouth for Offers Over £240,000. We are pleased to bring to market this semi detached bungalow which offers a spacious kitchen/dining room enjoying views across Teignmouth and the estuary, study/bedroom three, separate garage and off road parking for one car. The good size rear garden is tiered and sloped and requires some attention. White wood panelled ceiling with inset led lighting, Upvc half glazed door leading into rear porch with Upvc double glazed windows to both sides, range of matching modern wall and base units with wood effect worktop over, inset four ring gas hob with stainless steel extractor hood and light above, part tiled surround, integrated eye level oven and grill, space for upright fridge/freezer, further base units with wood effect worktop over and space for under counter washing machine, inset one and a half bowl stainless steel sink unit and drainer with mixer tap, Upvc double glazed french doors leading to rear garden, Upvc double glazed window to side offering views of the estuary and beyond, radiator, ample power points. Textured ceiling to coving, Upvc double glazed window to front and side, inset fireplace, power points, radiator, TV aerial point. Upvc double glazed window to front, power points, radiator, TV aerial point. Upvc double glazed window to rear, radiator, power points. Upvc obscure double glazed window to rear, three piece modern suite comprising low level WC, vanity unit with inset wash hand basin with mixer tap, part tiled surround, panelled bath with shower above, two wall mounted ladder style radiators. Single glazed door leading to outside WC, further single glazed door leading to rear garden. Steps leading up to sloped tiered rear garden bordered with mature shrubs and hedges, greenhouse. Two Upvc hatch doors leading to under house storage area, one area measuring 3.84 x 3.20, other 3.86 x 3.82, power and light, wall mounted combination boiler.